The Future of Banking is here, and it has been ushered with the help of emerging technologies that have made the whole digital banking experience less tiresome and more seamless. The days of brick and mortar banks where one had to stand in queues are over as more and more banks are leveraging online and digital channels to reach out to the next generation of customers. A big driver of the evolution of technology in banking industry will be Augmented Reality technology and it has been around for more than a decade. With almost everyone having a smartphone nowadays, Augmented Reality has found its new home in the palms of millions of users across the globe and is leading the way towards the future of banking technology. Banks have taken advantage of this futuristic technology for quite some time and your bank should not fall behind. Through this article we will take a look at banks that are leading the future of banking by using Augmented Reality to provide unique services to their customers. We will also touch upon what your bank can adapt from them. India’s leading bank in adopting new technologies and innovations in banking sector, Axis Bank got onto the AR bandwagon pretty early with their mobile banking app offering multiple augmented reality services. Using the ‘AR View’ option in the ‘Near Me’ tab, customers can define a geographical radius and the banking app can show them the nearest ATMs and branches and provide directions to an ATM. Not restricting to only cash withdrawals from ATMs, they also wanted to encourage their customers to use other perks that they offer such as special discounts at food outlets and eDGE reward points. For that they offered navigation options to the nearest food outlets as well and allowed users to pay with their reward points at these partner outlets. Your bank can use similar augmented reality features to help your customers locate the nearest branches and ATMs and use your navigation services to give your brand a positive image. Furthermore, you can encourage your users to pay using your payment wallets and cards thereby keeping them engaged with your banking services. Embracing the power of Augmented Reality technology and taking it to an international level, Westpac Bank in New Zealand launched their Augmented Reality Mobile app with lot of interactive features that reformed the way customers manage their bank accounts. Their app allows the customers to scan their debit or credit card with their phone’s camera. Overlaid on that card, customers can see their current balance, spending in the last two weeks, categories they have spent most on and future payments due on their credit cards. They can also complete their due payments through the Augmented Reality payment gateways seamlessly. Going the extra mile, this banking app’s UI provides the customers useful analytics and transaction details through augmented reality data visualisations that help them understand their spending patterns over time. Their HotPoints catalogue is also integrated into the banking app which allows customers to shop using Augmented Reality . They have also added an augmented reality navigation feature to help users get to their nearest ATMs in all of their international locations across the globe, taking the scale of this interactive technology to the next level. Westpac is a great example of how you can use Augmented Reality technology to provide enhanced and immersive customer experience. While most AR solutions in the banking industry are focused on the end customers who use banking apps on their smartphones, Citi Bank came up with Holographic Workstation, a Proof of Concept that is focused on financial traders as end users. 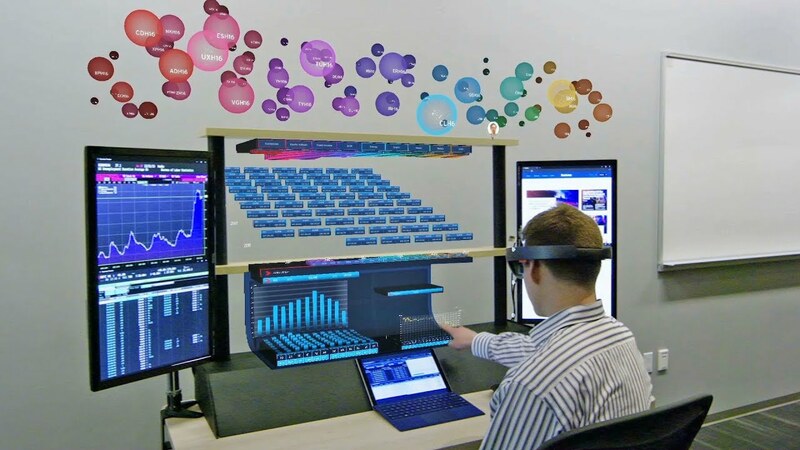 Using Microsoft’s HoloLens technology, they created a 2D-3D integrated system that allows financial traders to visualise real time financial data and records through holograms and to monitor and track past trends of stock indices so they can make financial decisions based on these. Users can also share their interactive, augmented reality data visualizations with someone in real time to work in teams and analyse the markets. For real world usage, real time communication and visual data sharing is also facilitated by the Augmented Reality system that works on voice commands given by the users. In the end, users can finalise trades and investments through the interactive holographic system itself. This whole setup is called the Holographic Workstation and it aims to increase the efficiency of financial trades. This example helps us in understanding how banks can engage segments of users that are not their direct customers, but can use their banking and financial services in an interactive way. With the motive of easing the process of finding a new home in Australia, Commonwealth Bank launched their Commbank Property app which has the data of about 95% residential properties in Australia. Using the Augmented Reality real estate app, users to scan a property near them in real time and get all possible information such as detailed suburb profiles revealing demographics, median price, buying/selling conditions, property hotspots, and capital growth trends, thus enabling buyers to gain deeper insights on a location and on whether it will suit their lifestyle. Users can also explore a property using AR through the real estate app before making a buying decision, that too without needing to physically explore the property. Corresponding to the property, the augmented reality app also displays monthly loan repayments based on prospective home loans the user can take based on their current financial health. If they end up finalizing the property, they can share it with their friends and contact a bank agent through the property search app itself. The biggest takeaway from this AR application is that it captures the whole customer journey from exploring houses to actually financing it through a bank thereby. This makes the AR real estate search app a one-stop destination for prospective home buyers, which is something your bank can do in any particular industry. To engage their customers in China, Standard Chartered came up with a unique idea for Breeze Living, their AR enabled mobile application. They created an open social network to find and share coupons and offers from all across China by partnering with local coupons platforms. They allowed users to sign up and create ‘Tribes’ where they can share these coupons with their friends as well. Using Augmented Reality, they simulated kites across the skyline and users could catch those kites to get exclusive offers all across the country. Users could also flaunt their offers to their ‘Tribes’ using the social media aspect of the AR app. The underlying motive behind launching this AR enabled app was to engage users through the coupons and encourage them to use Standard Chartered’s instant payment options to avail these offers through the mobile app itself. What made this idea stand out was that Standard Chartered created an application which was not directly related to their core banking business, but which engaged users and made them potential customers of their bank. If you too want to attract potential customers in a unique way, check out 21 brand activation ideas that'll get your creative juices flowing. Unlike other examples in this article, Deutsche Bank's augmented reality marketing campaign engaged customers in an offbeat way and left a positive impact on them. They set up a large Magic Mirror in Alexa Mall in Germany which was powered by Augmented Reality to give customers visual surprises. As customers stood in front of the Mirror, they got transported to the sea as they surfed in Augmented Reality, got the chance to meet unicorns in real (well, virtual) life, and ended up playing virtual football. People got transported to an alternate reality and recorded themselves doing these fun activities. The sole purpose of this augmented reality marketing campaign was to immerse people in a positive experience to leave a memorable brand image in their minds. Your bank can also use Augmented Reality marketing campaigns to activate your brand by building a positive brand image. To get started, check out some quick tips for planning your first Augmented Reality Marketing Campaign. The Insurance division of Desjardins Bank decided to make the experience of Retirement Planning fun and simple for its customers. They created an Augmented Reality application called ‘Your Way Desjardins’. It is powered by a fictional character named ‘Penny.’ Penny’s sole job is to help and educate the customer about various methods of saving for their future retirement irrespective of what stage of life they are currently in. Using a smartphone’s camera, this fictional character comes to life by pointing to a customised bank note and offers multiple learning options to its users to choose from. Be it starting early on or regularly contributing towards your retirement, Penny instructs the users on how to get started with interactive videos and also guides them through the whole process. These kind of applications of AR create financial literacy among the consumers in fun ways and help banks get potential customers as well. If you want to use the power of storytelling to send a message to your customers, learn from how Pexalon used interactive technology to connect with their customers. Visa, the leading payments provider in the world used the power of Augmented Reality technology to demonstrate how payments can be integrated with any service to facilitate seamless and immersive payments. This was presented at the Mobile World Congress. Integrating with a food ordering service, they demonstrated the AR app over a simulated map of a city. Using the AR app, users can point to specific parts of the city and pick a food outlet. Then, users can go over the menu of the outlet and have a look at the various dishes to finalise their order. Once the order is placed, users can process instant payment in AR using Visa. Such applications help financial institutions in offering features built on top of their payment systems to potential users. What Commbank did for house loans, Capital One Bank has done for car loans. They have launched Auto Navigator, an augmented reality app using which users can go to retail showrooms of cars or just be on the street and point to any car to get view details superimposed on the car. Details such as year, model number and make of the car will appear on their screen to help them with their buying decision. Users can pre-qualify themselves for a car loan after which, the car-loan app will show them customised pricing based on their eligibility, preferences and financial health. The intention behind such an augmented reality car-loan application was to bring the whole customer journey of buying a new car on a single app that takes the user from exploration or awareness to decision or buying stage through the mobile app itself, thereby creating a direct sales funnel for the bank. This offers a great opportunity for a bank to create augmented reality applications that facilitate loans through immersive interface. A huge problem faced by bank employees is that of remembering the details of all the products and services they offer. To help their employees, BNP launched an interactive print app that recognizes the photos of bank employees and overlay videos on their photos explaining various products of the bank, thereby eliminating the need for employees to remember details about all the services. This application of AR highlights how interactive print can help reduce the work of employees and make the training process immersive and more efficient. If you're still using printed pamphlets to provide information about your products, act now to not be left behind. Check out how interactive print can help your marketing and branding initiatives. Last and probably the most surprising use of Augmented Reality technology in the banking industry has been by ASB in recruitment of corporate bankers for their organisation through an Augmented Reality application. The bank wanted to communicate their story and innovative spirit in all their future endeavors to woo high-potential candidates to apply to their bank. Using the AR app, a potential candidate can scan the pamphlet and bring it to life. Then, the candidate can witness the Executive General Manager of the Bank himself, talking about the bank’s values, future hopes and why their bank is the perfect destination for a high potential candidate to work at. Using AR in recruitment and brand communication is not the most intuitive use-case, but certainly a very novel one that can go a long way in differentiating your bank from the rest. The banking industry is going through a massive transition to get the next generation of tech-savvy individuals on their platforms through various means. Emerging technologies such as AR have been a boon and a significant contributor to the future of banking by letting banks create immersive customer experiences, platforms and applications that lead to higher user engagement, seamless banking solutions, and positive brand communication. In this highly competitive market, your financial institution can leverage AR to create innovative tech solutions that can set you apart from the rest and position you as a future-ready and innovative bank. Learning from the above examples, your bank can create solutions such as navigation systems, instant payment methods, social platforms, e-learning resources, and marketing campaigns powered by Augmented Reality to become a part of the future of banking. Okay, let me be outright clear here. I don’t want you to attack your customers or blow off your enemies with machine guns. That’s a TV show and let the macabre parts stay there. 6 Facts About The History of Augmented Reality That You CANNOT Miss! The early decades of Augmented Reality unknown to many of us. Here's some facts about the history of Augmented Reality.